I’m sat at the bar in Kiev’s CyberArena, a dark hall filled with rows and rows of computers. There’s more than a hundred young men, most in their late teens, playing World of Tanks, Dota 2, and Counter-Strike. A few months before this hall was empty. The building shut down in January. The city wasn’t safe. I’m with Vitalli ‘V1lat’ Volochai, a prominent Russian-speaking eSports caster, and Iegven Dubravin, manager of Na’vi’s Dota 2 team. They’re trying to explain how they ran their business whilst their country was embroiled in a revolution. “It exploded on the dates of the tournament,” says Iegven. “We had to hire an armoured vehicle with [bodyguards] and they were riding from here to the airport with teams because they wanted to stay safe.” Vitalli says. It has been a wild, wild year for Ukraine’s brilliant PC developers and community. Ukraine has been pumping out great PC games for years. From its bleak landscape has emerged the Stalker series, the Metro series, Cossacks, and more recently World of Warplanes. But over the past year it’s seen massive political upheaval, with vast protests within the capital, Kiev’s, central square. In February after government snipers shot and killed more than 80 protesters, its president, Viktor Yanukovych, fled the country. Crimea, a region in south Ukraine, separated from the rest of the country and became occupied Russian territory. I wanted to discover what it was like for the PC gaming community, living through such dramatic times. I flew out to Kiev to meet with developers and discover how the country has changed in the past year, finding what life was like before, during, and after the protests. It all starts with education. And Ukraine’s excellent college courses. Many of the developers produced by Ukrainian universities became contractors, working for companies outside of the country, either porting games or creating assets for other studios. But eventually, a critical mass of bright young developers led to mega-studios, living and working within Kiev. Homegrown studios are doing well, too. 4A Games and Vostok Games, respectively the makers of Metro and Survarium are based in the city. And, before it collapsed, GSC Game World, creators of Cossacks and Stalker, set up shop in an abandoned warehouse. For all of Ukraine’s homegrown successes, there was always a weight around any entrepreneurial activity: the Ukrainian government’s rampant corruption. It’s estimated that the Ukraine’s former president, Viktor Yanukovych stole half of the country’s national budget. While roads crumbled and essential services suffered sustained austerity, Yanukovych built a fortune. Yanukovych’s palatial home included a private zoo and cellar stocked with personalised vodka bottles. When he fled, he loaded trucks with cash and valuables and sent them out of the country. However, while studios may open in Ukraine, developers find it very hard to keep hold of their staff. That same cost of living makes Ukraine an attractive place to run an eSports team and tournament. Na’Vi, one of the most successful eSports brands in the world, started life in Ukraine. Meanwhile, Starladder tournaments are some of the largest in the world, offering prize pots of almost $200,000. I can attest to that. A bottle of vodka was cheaper than the bag I bought to carry it in. But it all came to nothing. Ukrainian developers faced a complex problem. On the one hand, its universities, cheap living costs, and open borders encouraged a very active games industry. On the other the government at its heart stifled development through criminal corruption and hefty taxes, lowering the standard of living and fostering an environment where game developers would emigrate. But that activity came under threat: as Ukraine’s political situation began to deteriorate with Yanukovych’s election in 2010. Yanukovych had a criminal past. In his youth, before becoming a politician, Yanukovych was twice sentenced on charges of assault and once for robbery. Then, in 2005, he was charged with fraud. The case was dropped a year later due to a lack of evidence. As he came to power, he seemed to turn a blind eye to Ukranian gangs. The crime rate dramatically increased, conviction rates dropped, and discontent spread across the country. Ilya Tolmachev, a developer at Flying Cafe for Semianimals takes up the story. Kiev erupted. 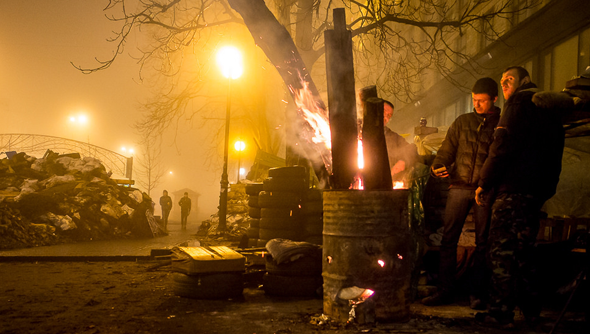 The Maidan protests had begun. In part two: meet the PC game developers who risked their lives in the centre of Ukraine’s Maidan protests.